The film “Blackfish,” released earlier this year, has now become synonymous with the exposure and condemnation of the stress-inducing lives led by captive whales such as Tilikum – a 23-foot long bull orca who has lived in captivity since 1983, and drowned SeaWorld trainer Dawn Brancheau in 2010. So why exactly do orcas experience such profound frustration as a result of being captured? If – as Fred Jacobs, vice president of communications at SeaWorld claims – the whales’ imprisonment is necessary in order to ensure their conservation, and they do not suffer in any way as a result of their captive status, why do they consistently demonstrate greater levels of aggression in captivity than they do in the wild? A comparison of their natural behavioral patterns, as opposed to the lives they must endure in aquariums and amusement parks, reveals the answer. 1. They only live up to their “killer” nickname in captivity, not in the wild. Orcas are often referred to as “killer whales,” in a sensationalist nickname reminiscent of “Jaws“. But this is, in fact, something of a misnomer. 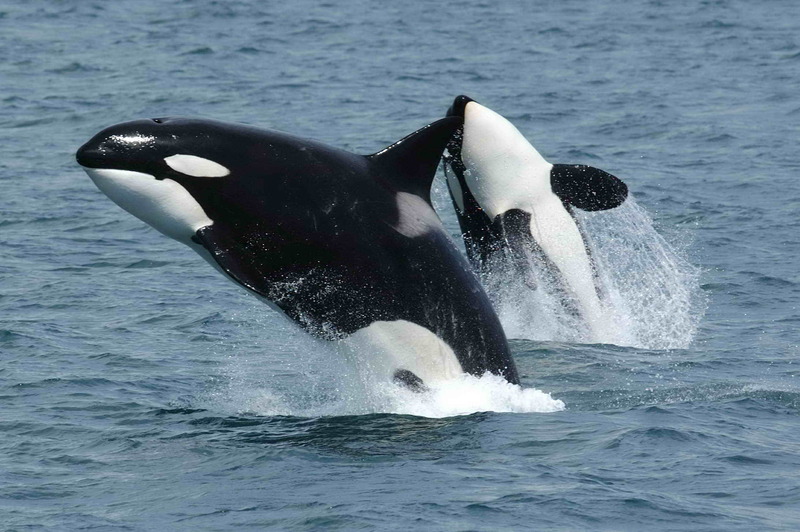 While orcas are a carnivorous species – feasting on a wide variety of prey such as salmon, squid, turtles, sea birds, manatees, dolphins, and even other whales – there are no documented cases of wild orcas killing human beings. In the few isolated cases where the wild whales have attacked humans, none have ended in death. It seems that the “killer whale” tendency only emerges when they are kept in captivity, as there have been many recorded incidents involving aquarium whales lashing out at their trainers, several of which have been fatal. 2. They are not provided with adequate social interactions. Orcas are highly social animals. In the wild, they live in tight matrilineal pods, typically composed of their grandmothers, mothers, sisters, brothers, aunts, uncles, and cousins. Even when they reach sexual maturity, both male and female orcas typically choose to remain with their immediate family group for the rest of their lives. When orcas have displayed this capacity to form such deep, lifelong bonds with their family members – just like we humans – how can SeaWorld claim that they are not harmed in any way once those bonds are brutally severed? Putting a group of newly captured orcas – traumatized after having been torn away from their families – into a small enclosure, and asking them to “socialize” with one another could be seen as the equivalent of forcing a group of human strangers who speak different languages and come from different cultural backgrounds into a small room, and informing them that they must now spend the rest of their lives together, whether they like it or not. 3. They receive little to no stimulation. Marine activist Colleen Gorman, of The Orca Project, observed SeaWorld’s treatment of Tilikum after he had killed Dawn Brancheau, and dubbed him the loneliest whale in the world as a result. During this time, she observed that he was kept apart from the other whales, fed intermittently, and received scant attention from zoological staff. While he was later able to return to his regular performances, can this really be regarded as an improvement in his life? After all, the stress of performing was arguably the very thing that led him to lash out at Brancheau in the first place. 4. They can suffer from dorsal fin collapse. Although SeaWorld has claimed that dorsal fin collapse “isn’t an indicator of the animal’s health or well-being,” this phenomenon is rarely seen in wild orcas. It is believed that captive whales experience it because they spend much more time at the water’s surface, swimming in the same direction in a small pool. In addition, they receive less hydration from the frozen-thawed fish they are fed in marine parks, as opposed to the fresh fish they would eat if they were hunting in the wild. All of these factors can cause a captive orca’s dorsal fin tissue to atrophy and flop over onto one side. 5. They lack proper exercise. Can the captive orca’s exercise regime of repeatedly circling its tank, performing tricks, and taking part in shows with names such as “Clyde and Seamore’s Christmas Special and Cirque de la Mer” ever compensate for the activity levels their wild counterparts can expect to enjoy? SeaWorld has recently claimed to be alleviating its whales’ lack of exercise by installing a new whale treadmill on their Orlando premises. But if you were a whale, and were given the choice between captivity and freedom, would you choose to turn circles all day on an artificially constructed treadmill? 6. Their intelligence goes unacknowledged. The brain of the orca is four times larger than the human brain, weighing in at 12 pounds. As their brains have been evolving for millions of years, while modern-day humans first emerged about 200,000 years ago, it is safe to assume that their cognitive development is at least as advanced as ours – if not considerably more so! The complex familial and social relationships that can be observed amongst a pod of wild orcas show us that these creatures are highly self-aware, adaptable, and intelligent. Bearing this in mind, the idea of reducing them to objects of human amusement – whose sole purpose in life is to perform tricks whilst inhabiting tiny concrete tanks – is a travesty. If you want to see orcas, the best way to do so is to witness them in their wild, natural habitat. Educate yourself. If you want to be a more outspoken advocate for captive whales, make an effort to find out more about the complex legal, political, and financial factors at play in the whale captivity industry. “Death at SeaWorld,” David Kirby’s disturbing exposé of the industry, is a good place to start. There are many marine protection groups dedicated to the well-being and preservation of orcas – both wild and captive – including Whale and Dolphin Conservation, the Oceanic Preservation Society, the Humane Society of the United States, and Keep Whales Wild. You could make a financial donation, or volunteer with initiatives such as event planning, fundraising, or petition drives. How would we like it if the situation were reversed? I hope that people are able to release the killer whales. There is a lot of hate for aquariums, and for a good reason.We need to help save our marine life! im with you on this but its not as simple as saying just release them. First the orcas are untrained so they would go through a complicated life and secondly the marine park would have to take down the orca pool and replace it which would take alot of money. I find this article very interesting. I wish all orcas lived free.